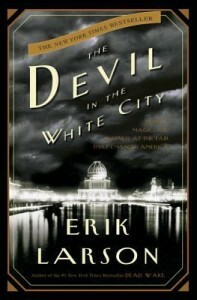 Erik Larson takes an unusual approach in The Devil in the White City and ends up telling a tale of two men who played a role in the 1893 World’s Fair in Chicago in this classic true crime book. Architect Daniel H. Burnham’s story focuses on the building of the impossible, creating an extravaganza in spite of time, budget, personnel, and weather constraints. It was the showcase of technology that ushered in the 20th century and still has remnants in Chicago to this day. On the other hand, serial killer Herman Mudgett’s story is filled with terror and gruesome details of the killings that went on in the background of the wonder of the World’s Fair. Larson masterfully balances the sick cruelty of Mudgett with the financial and architectural details of the creation of the fair along with interesting tidbits of Chicago history to tell the story. Just when the reader cannot take the unspeakable horrors any longer, he changes gears to the most minuscule detail of the fair planning or statistics of attendance. It doesn’t create confusion, but rather makes the reading bearable. And it is a story that needs to be read.